I know, I know. I don’t typically veer away from Foodworld around these parts, but seeing how absolutely intense and exciting the last few days have been…well, a mini detour was in order (as was a long…looooong nap). 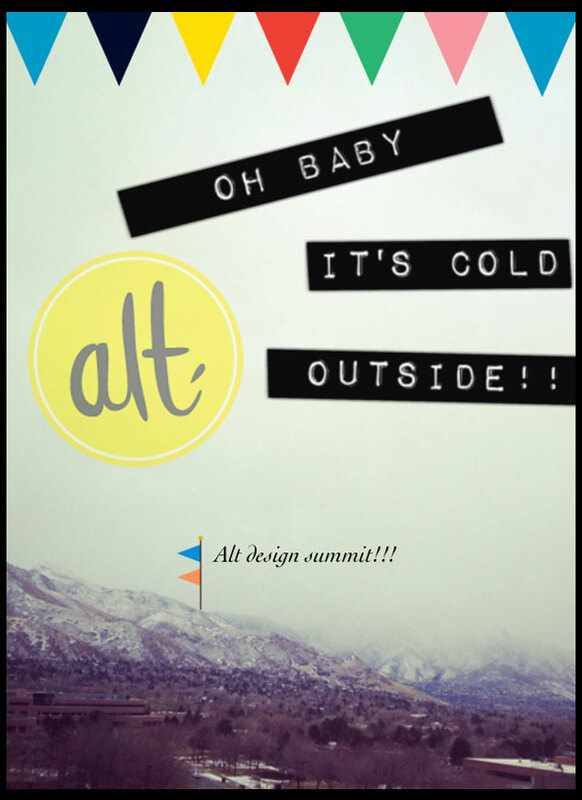 This past week, creative lovelies from all over the country descended upon Salt Lake City for Alt Design Summit. Being someone who usually only attends new media or food conferences, I had no idea what to expect in a land full of perfectly styled designers, quaffed fashion peeps, poised photographers and well, overall awesomeness. It was all, in a word…awesome. Really. Truly. Awesome. You know what? Sometimes we need to step out of our comfort zone to grow. Recently I took a major jump from a safe full-time/big-time corporate creative job to explore the world of unpredictable/lonely/scary/eeep! freelance and consulting…and you know, do my own thang. On this Utah adventure I met so many amazing people that were doing just that: their own thing. What sweet relief! What sweet joy! “Blog” was no longer a four letter word among friends. I found a support group. More importantly, I found a community. When I talk community, I’m talking going beyond the tweets, the hearts on instagram and comments on that book of faces (which are all still encouraged and loved, but I’m saying we need to do more). As creative content providers we should to stick together, pause for a second, high five and offer up some support and resources. Hello, it’s 2012! We need to Collaborate, inspire and mentor. We need to get friendly with each other. Offline. 1. Eva: Eat here. 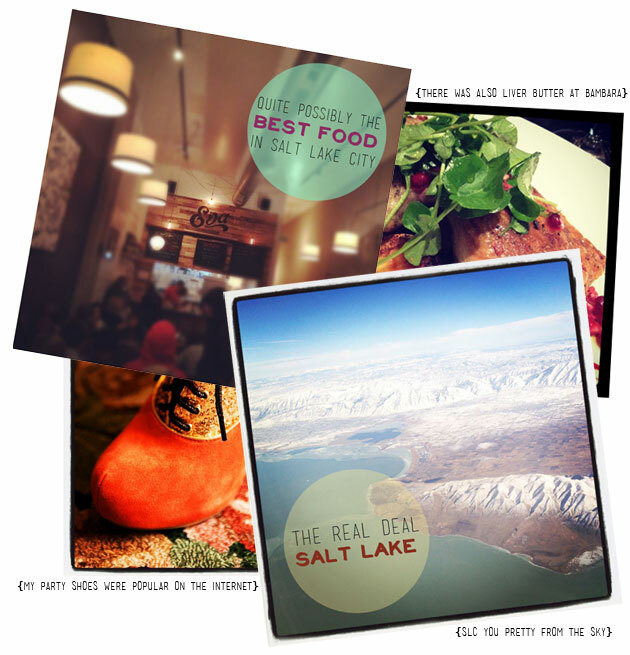 If you find yourself in SLC, this might just be the best dinner in town. Hit list included: The Fig & Pig flat bread, radicchio salad with fried potatoes and Moroccan lamb stew. Yes please, I’m recreating these at home. I also hear that Tin Angel is superb, but conference life took over my usual eating priorities, so it’s on the list for next year. 2. Bambara: you had me at houndstooth booths. You also had me at Liver Butter. Yes, it exists. Yes, I ate it. I even wanted more than was provided. Subsequently, my mother demands that I have another physical ASAP. I suppose that is a bit decadent for the ol’ ticker to enjoy on a regular basis. But hey, special occasion, right? This organized “who’s coming to dinner” was full of amazing creative ladies, new camera bags, and excellent service. 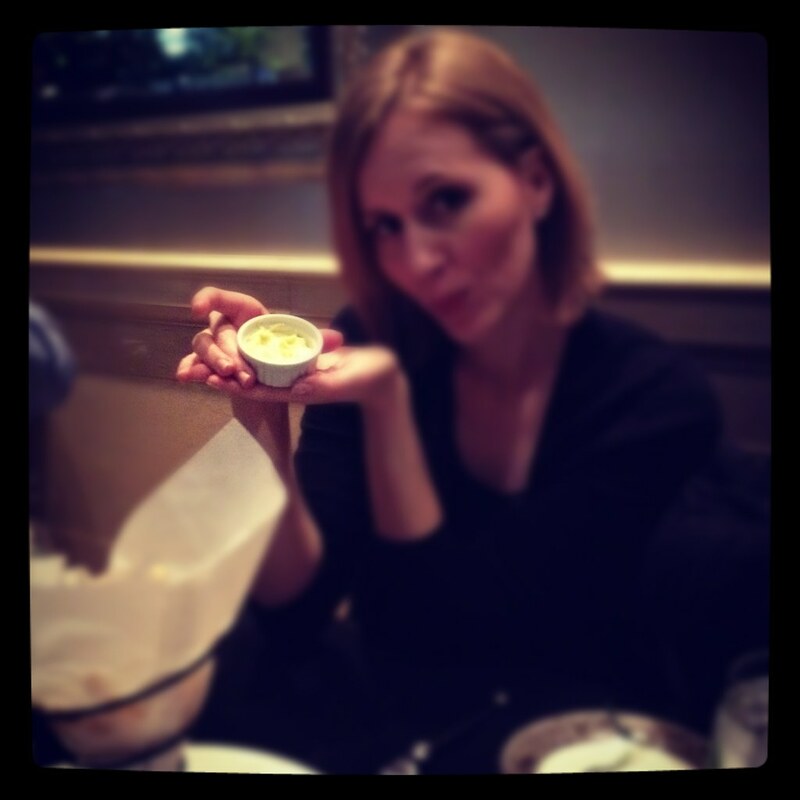 Also, design bloggers were introduced and falling deeply…deeply in love with aioli. Yup, you’re welcome. 3. White Party What!? Yeah. I think it stressed out even the most put together attendee, but you know what – it was a stunning sight. Lace, sequins, tulle, oh my! Here are a few of us taking advantage of the slopes mid soirée. 4. During Friday’s keynote 400+ girls feel into a deep sigh and full on crush with This guy. What an incredible speaker and an inspiration to all: Pin away pretties…our future depends on it. While we’re on the subject, you can find me here. I need to step up my game and start contributing myself. 6. Oh and this happened. Smilebooth, you rocked my boat and sent me sailing into a shutterbug frenzy. I am trying to figure out an excuse to see you again because frankly, you’re addictive. Also, Brooke here (above) is good times. She also is an excellent photographer…we met at a place named “Squatters” and had a cocktail at a dive called “Cheers To You”… I suppose in some countries that equals friends for life? Happily so. She’s rad, go say hello. In fact, there are quite a few new friends you should get to know. Head over here and follow my ALT 2012 Tweet List. Get ready to start crushing…I sure did. Still am. This list will continue to grow as I sort through this massive stack of perfectly designed business cards. Speaking of, check out how awesome some of them are right here. Really Alt goers…you brought it. Hard. Sooooo…back to business. What is this idea of redefining communities in 2012? Let’s start building relationships with other creatives offline, online and everywhere in between. For people who are overly plugged in, it’s amazing that there can be moments of loneliness and disconnect. What if we opened up a dialog with our heroes and peers? What if there were mini work shops, inspiring conversations and even a glass of wine? We need community to help us grow. That being said, I’m planing to start a local meet-up every other month here in Los Angeles for any of you interested food and design bloggers. You know how special it feels to get a handwritten letter vs. an email? Yeah, it’s going to be something like that. Let’s unplug for a minute and have some face time with other exceptional creatives. We just might learn a thing or two. You might just meet someone who inspires your next big project. Hit up my contact page if you want in on the Los Angeles mailing list, have ideas for a meeting, or might even be interested in sharing your expertise as a guest host. Not in the Los Angeles area but want to keep the spirit of community alive in your own town? DO IT! Alt was inspiring, we can’t wait for next year…keep this fire burning! I promise, 2012 is going to rule. 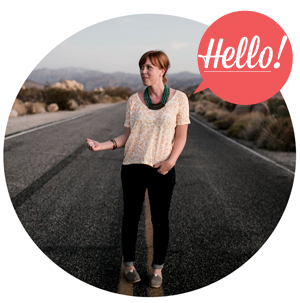 Would love to join in on the LA fun Great recap and how did you animate that Method shot? Genius! Would love to join the LA fun but alas am up the coast in Vancouver, Canada. Am planning to get something similar rolling here though. Meeting in real.life is sooo great – one of the benefits of Alt! I loved being around a zillion people who love.beautiful.things. And like you said, for whom blog is not a four letter word! Think we may have found our tribe. Glad you ventured out from the foodies – there were others there too! @Sandra – wasn’t it a magical time!? I’m so glad to hear you’re planing community meet ups in Vancouver. Keep me posted, I’d love to hear what you’re up to!! Me! Me! Me! I want in SO bad. 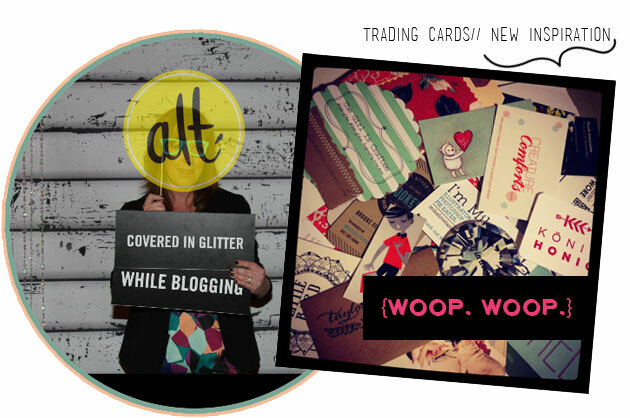 Loving all the recaps from Alt! Makes me want to make sure I go next year! If I make it South you will be the first person I look up! Hello new friend. such a good recap! i would love to go to alt someday! i’m all the way in italy but you got me thinking – a blogger meet-up over here in the boot would be spectacular! p.s. new to your space and i love it!